Most of the users who have some data problem with their Mac Outlook ask – What is an Olm file? The question is frequently put up by the users who are looking to migrate their data from Mac to Windows Outlook. That’s when they first come across Olm format. It’s a data file format associated with mac Outlook. Unlike other email clients, Mac Outlook doesn’t use this file as an identity file, but rather as an archive file. You can manually archive your emails to an Olm file for backup (see below), or use Time Machine to set it up automatically. Data archiving is the best method to free up some space in your email server. If your inbox is getting full, that means the allowed space in your server has been crossed. In that case you can archive your emails to an offline Olm file and keep it safe for future use. You can then delete the same emails from inbox. What is an olm file & How to Archive data to Olm file? Go to ‘File’ → ‘Export’. Choose “Outlook for Mac Data File”, then choose the items you want to export/archive. You can also filter the items by categories like mails, contacts, calendar, etc. Click the right arrow, and follow the instructions. If you use Exchange account or directory services, directory contacts won’t be exported. Items in public folders won’t be exported. Your Outlook Preferences won’t be exported. How to Open an Olm file in Mac Outlook? You can open Olm file in Mac by simply double-clicking the file and using Mac Outlook to open it. You can also open it by importing the file to Mac Outlook through its export/import feature. To do that, go to ‘file’, click ‘Outlook data file’, click right arrow, select data file type as .Olm, click the right arrow again, locate the Olm file on your computer, click ‘Import’. This will give you the access to all the data inside the Olm file in a nice folder in Mac Outlook named ‘On my Computer’. Note* – this applies to Outlook 2011 for Mac, but the procedure for other Mac Outlook versions are almost similar with one or two differences. Olm file is not a generic file format like Mbox or Eml. You can’t use it with any other email client, not even Windows Outlook. This is surprising for some when they realize it the first time. Outlook for both Mac and Windows and somewhat same email client but in different platforms. And it gets more interesting to note that the data file of Windows Outlook (Pst) can be imported to Mac Outlook. But it is not possible to import Olm file to Windows Outlook. There are few third party apps specifically developed for opening Olm files without Mac Outlook. They are not an email client so they don’t have any functionality, other than just to display the content inside an Olm file. Other than that, they can’t be opened or imported by any email client. This can be a bit troublesome for users switching to a different email client. How to Convert Mac Olm file to Pst file? 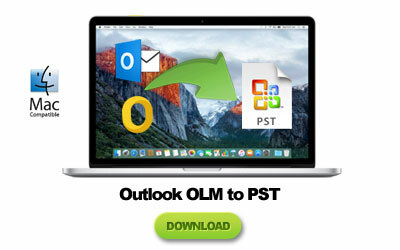 If you have an Olm file, you can try to convert it to Pst in order to import the data to Windows Outlook. However, the issue with that method is lack of proper tools to convert files. Most users who go ahead with Olm to Pst conversion end up wasting a lot of their time with truly poorly built software. The biggest concern is incomplete conversion, where the output Pst files are seriously damaged and the integrity of your data is compromised. However, there are few tools that do offer relief in this regard. Such as Gladwev’s “Olm to Pst Converter Ultimate”. You can manually load any number of Olm files and it will convert them to Pst without any compromise to integrity. The entire conversion process takes place quickly but there is no loss to data. All your embedded images, folder hierarchy, non-English text, meta-data, headers, attachments, nested emails, and other information remain preserved. You won’t find any glitches with the output Pst files; they mirror the data in source Olm files. What Benefits does ‘Ultimate’ tool offers over others during Olm to Pst Conversion? There are many Olm to Pst converters in the market that claim to convert Olm files to Pst. However, there would be nothing like ‘Ultimate‘. The reasons are given below. Offers great speed for data conversion, which is a relief since all other tools usually take up a long of time to convert even a single Olm file to Pst. It can also load data without an Olm file and directly from identity folder (see below). It has been built to offer thorough conversion, without any loss of information. Developed by Gladwev Software, it offers reliability and trust for optimum experience. Furthermore, there is 24×7 customer support for your help. If you have got an Olm file from somewhere else, like with an email, or someone shared it with you, then the above method of manually loading it to the “Ultimate” and converting it to Pst is fine. However, if your objective is to move content from Mac to Windows Outlook, you have another, much better option, than Olm to Pst conversion. 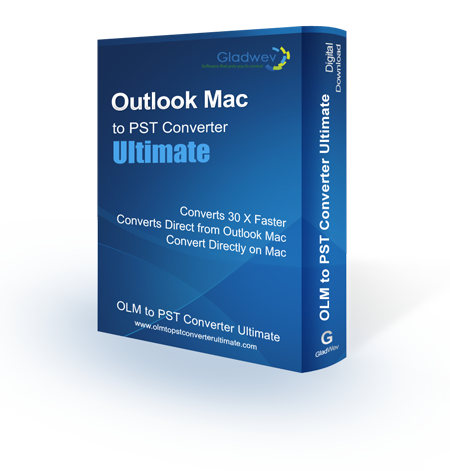 “Olm to Pst Converter Ultimate” can auto-detect your identity folder with Mac Outlook and convert data to Pst files straight from there. You don’t even need to archive anything to Olm file. Of course, this is applicable in situations where the data to be migrated is inside the identity folder and not from any other location. You can download “Olm to Pst Converter Ultimate” from the links given below.